NB – For temporary on-street bike parking, e.g. when shopping or visiting, see our bike parking page. 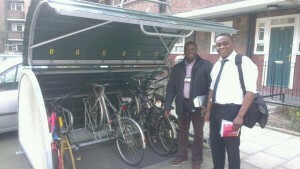 Difficulty in storing a bike at home can be a serious deterrent to bike use and therefore makes it harder for Councils to achieve targets for increased bike usage. This can apply to a wide range of accommodation types, including flats, tenements and terraced houses without easy access to a back garden. Research – evidence that tenement bike storage problems in Edinburgh are resulting in reduced bike use – see the paper by Dr Tim Ryley [item 0809 on our ‘local research’ page]. Onstreet secure bike storage – Councils could make a huge difference by providing secure [covered and lockable] onstreet bike storage. Although this will often mean removal of car parking spaces, removal of one car space can provide bike storage for 6 or more bikes. Edinburgh City Council is working on this [but slowly] – see below for developments. There is a strong equity argument that if the majority of residents of a tenement wish one car space outside their block replaced by multiple bike spaces, the council should make this change, rather than providing only for the minority of residents who wish all spaces to be for cars. If necessary, raise this with your councillors. Edinburgh’s pilot scheme is most welcome but taking a very long time indeed, as this timeline shows. Meanwhile things are moving much faster in some London councils – see section below. 1810 Delayed rollout now going ahead on increased scale. Report to 4.10.18 Transport Committee. NB report was approved with added decisions – see item 9 of minutes. 1410 Edinburgh pilot scheme at last fully in place! One user’s experience [with photos]. 1405 Hackney Borough example Part of the delay in Edinburgh has been the need for Traffic Regulation Orders to legally convert onstreet space to bike parking. London had similar problems but several Boroughs seem now to have speeded things up considerably. 1312 Draft Traffic Regulation Order TRO/13/31 [pdf 21k] and Location maps [pdf 299k] for pilot storage scheme. Installation now expected in April. 1203 Edinburgh Council chooses 6 applicants for the pilot storage project. Next stage is to agree with the applicants the type of storage, then to promote the necessary Traffic Regulation Orders where the storage is onstreet. 1701 London CycleHoop.rentals website Great website, CycleHoop working with various London Boroughs, so individuals can locate and book spaces online, and can suggest new locations.